Washington Monthly is a bimonthly nonprofit magazine of United States politics and government that is based in Washington, D.C. The magazine is known for its annual ranking of American colleges and universities, which serves as an alternative to the Forbes and U.S. News & World Report rankings. The magazine was founded in 1969 by Charles Peters, who wrote the "Tilting at Windmills" column in each issue until 2014. Paul Glastris, former speechwriter for Bill Clinton, has been Washington Monthly's editor-in-chief since 2001. In 2008, the magazine switched from a monthly to a bimonthly publication schedule, citing high publication costs. Past staff editors of the magazine include Jonathan Alter, Taylor Branch, James Fallows, Joshua Green, David Ignatius, Mickey Kaus, Nicholas Lemann, Suzannah Lessard, Jon Meacham, Timothy Noah, Joe Nocera, and Steven Waldman. In 2008, the liberal watchdog and advocacy group Common Cause considered acquiring Washington Monthly, but the deal fell apart. The politics of Washington Monthly are often considered center-left. Founder Charles Peters refers to himself as a New Deal Democrat and advocates the use of government to address social problems. His columns also frequently emphasized the importance of a vigilant "fourth estate" in keeping government honest. Washington Monthly features a continuing blog; "Political Animal" was written principally by Kevin Drum for several years, with frequent guest contributions by Washington Monthly's current and alumni editors. In 2008, Steve Benen took over as lead blogger; in 2012, he was succeeded by Ed Kilgore. Kilgore left the magazine in 2015. In addition to "Political Animal," the magazine's website also hosts "Ten Miles Square," a general blog featuring posts from staff and political scientists, which debuted in 2011, and "College Guide," a blog about higher education, which the magazine began offering in 2009. Washington Monthly's annual college and university rankings, a deliberate alternative college guide to U.S. News & World Report and Forbes College Rankings among domestic publications, began as a research report in 2005. It was introduced as an official set of rankings in the September 2006 issue. Its "National Universities Rankings", most recently published in 2016, began as a research report in 2005, with rankings appearing in the September 2006 issue. Washington Monthly rates schools "based on their contribution to the public good in three broad categories: Social Mobility (recruiting and graduating low-income students), Research (producing cutting-edge scholarship and PhDs), and Service (encouraging students to give something back to their country)." The Washington Monthly receives financial support from the Lumina Foundation to provide coverage of post-secondary education-related issues. The magazine has also received funding from the Schumann Center for Media and Democracy, the Carnegie Corporation of New York, and individual supporters, including Warren Buffett and Markos Kounalakis. ^ Peters, Charles. "Why bad news should always trickle up ... Polyester and merlot ... The hippest fund-raiser in New York". Washington Monthly (Jan–Feb 2014). Retrieved November 9, 2014. ^ a b Carr, David (April 22, 2002). "New Life for Washington Watchdog". The New York Times. The New York Times Company. Retrieved June 13, 2012. ^ Birnbaum, Jeffrey H. (February 19, 2008). "Common Cause, Washington Monthly Explore a Common Future". The Washington Post. The Washington Post Company. Retrieved April 30, 2010. ^ Calderone, Michael (May 27, 2008). "Washington Monthly not merging with Common Cause". Politico. Retrieved December 7, 2015. ^ "Media Bias". Politics Unspun. 2016. Retrieved February 6, 2016. ^ Kilgore, Ed (December 24, 2015). "Is America Really Moving Left?". New York. New York Media, LLC. Retrieved February 6, 2016. ^ Karlgaard, Rich (September 14, 2006). "Republicans For Divided Government". Forbes. Forbes, LLC. Retrieved February 6, 2016. ^ "And that's a wrap". Washington Monthly. January 2012. Retrieved January 31, 2012. ^ Glastris, Paul (November 20, 2015). "Ed Kilgore: Some Going Away Thoughts". Washington Monthly. Retrieved February 6, 2016. ^ "Welcome to the New Washingtonmonthly.com". Washington Monthly. April 2011. Retrieved November 4, 2011. ^ "Welcome". Washington Monthly. September 2009. Retrieved November 4, 2011. ^ "The Washington Monthly's Annual College Guide"
^ a b c "Washington Monthly's National Universities Rankings". The Washington Monthly. Retrieved September 13, 2017. ^ "Strategic Media Partners: Washington Monthly Corporation". Lumina Foundation. 2014. Retrieved February 6, 2016. ^ Hagey, Keach (July 1, 2011). "Liberal journalism's fickle godfather". Politico. Retrieved December 7, 2015. ^ "Grants Database: Washington Monthly Corporation". Carnegie Corporation of New York. 2016. Retrieved February 6, 2016. 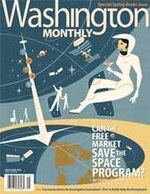 Last Call for the Washington Monthly? New York Review of Magazines, May 2008.